Made of drop forged high-grade carbon steel. Used for setting and cutting bricks, masonry tile, and concrete blocks. Drop forged from high grade steel, balanced with a fully polished, hardwood handle; used to break, trim or clean brick; not intended for striking chisels or metal. Hammer has polished striking head, sides and blade, face with beveled edges; select, flame treated handle, double wedged and epoxy sealed; should not be used to strike any metal surface. Forged head with permabond construction between head and handle, 1 1/8" sharp cutting bit and black epoxy powder paint on head. 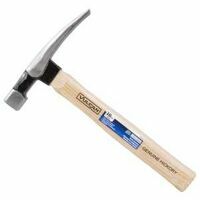 One piece forged solid steel construction, co-molded contoured handle with a high luster, fully polished finish. Anti vibration feature absorbs shock and minimizes muscle fatigue. Hammer has polished striking head, sides and blade, face with beveled edges; select, flame treated handle, double wedged and epoxy sealed; should not be used to strike any metal surface.